Not Published Yet? Cheerios Contest! So, You Think You Need an Illustrator? Quotes from First Grade Kids! Writing Contests---Where Can They Take You? 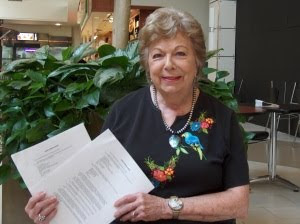 Several months ago my friend and published author of 31 books, Marilyn Donahue, graciously permitted me to present her wonderful post on the "I Am From..." poetic form. I asked my readers to get the creative juices flowing and try the "I Am From..." Well, my blogging friend, Janet Smart, did just that. Boy, did she do it! Janet gave me permission to post her beautiful piece. To scatter in the breeze. To grab hold and swing. With the scent of roses and lilac bushes. For a visit from a night breeze. Did Janet's I Am From Appalachia inspire you to give it a try? It inspired me! Janet is an amazing writer and her photographs are breathtaking! When I first began to write, I felt as if I were talking to the wind. I typed up manuscript after manuscript and sent my precious words to big time magazines. It turned out that I was the only one who thought they were precious. I collected enough rejection slips to paper a wall of my “office” — a corner of the family room where I had set up a card table, a portable typewriter, and a ream of paper. I’ll admit that I was discouraged. But in a family with four children, a cat that had just produced six kittens in the clothes hamper, two large iguanas, a South African Jackson chameleon that lived in a fish tank and ate live meal worms, and my son’s pet snake — there was little time to mope. I decided to switch from the long-winded, academic articles nobody wanted to read and write, instead, about things I knew first hand — things that happened in my family and, likely as not, in families everywhere. I approached the local weekly newspaper and offered to write a weekly column of short, family oriented pieces that would make their readers laugh — and sometimes make them cry. I didn’t ask for pay, and the editor said he would give me a chance. Before long, people began talking about the “Coffee Break” column that someone named Mary Robb was writing. The editor offered to pay me one dollar an article. I agreed. Did I give my writing away too cheaply? I don’t think so. * It gave me a chance to establish a pen name. * It gave me an audience that asked for more. * It taught me the discipline of writing for a weekly deadline. * It made me search my brain for new subjects to write about. And — the BIGGEST bonus of all — I began to use the seeds of these articles to write longer, more detailed stories that I sold to magazines for much, much more than one dollar! was the smartest career move I ever made. It showed me that focus is important and that writing about what I know pays off. It taught me that the joy of seeing my words in print outweighs dollar signs. And it gave me the self confidence I needed to keep trying. Are you a children's writer but yet to see your work in print? The Cheerios Contest could be your opportunity to see your picture book published! Writers who have never been paid for their writing are allowed to enter. Only writers from one of the 50 states (or DC) can apply, and must be 18 or older. Because I'm published, I can't enter---but I'll bet someone reading this, CAN! 1. Keep it simple. "He said" and "She said" will usually do. Your reader is trained to accept this repetition. 2. Forget you ever heard of strong verbs. Skip the "He yelped" and the "She sighed." They slow your dialogue down. If you feel need them, look at the words,the actual dialogue your character used when he was yelping. Maybe it doesn’t reflect the way someone would sound if he yelped. Maybe if you strengthen the dialogue, you can ditch the overblown tag. 3. When you can, reveal who is saying something by the voice or tone of the dialogue. That way you may be able to skip tags occasionally, especially when you have only two people speaking to one another. Your dialogue will ring truer, too. 4. Avoid having characters use other characters’ names. In real life, we don’t use people’s names in our speech much. We tend to reserve using names for when we’re angry or disapproving or we just met in a room full of people and we’re practicing out social skills. Having a character direct her speech to one character or another by using her name is a lazy writer’s way of directing dialogue and it will annoy the reader. When a reader is annoyed, she will not be immersed in the story you are trying to tell. 5. Avoid putting internal dialogue in italics. Trust your reader. She will know who is thinking the words from the point of view of the narrative. 6. Be cautious about using dialogue to tell something that should be shown. It doesn’t help much to transfer telling from the narrator to the dialogue. It just makes the character who is speaking sound long winded. Putting quotation marks around exposition won’t draw the reader into the scene or involve him more than if you’d left it part of the narrative. 7. And magic number seven is, don’t break up dialogue sequences with long or overly frequent blocks of narrative. One of dialogue’s greatest advantages is that it moves a story along. If a writer inserts too much stage direction, it will lose the forward motion and any tension it is building. For more on writing dialogue check out Tom Chiarella’s Writing Dialogue (Writers’ Digest) and for more on editing in general--from editing query letters to turning unattractive adverbs into metaphoric gold--find The Frugal Editor: Put Your Best Book Forward to Avoid Humiliation and Ensure Success on Amazon. Carolyn Howard-Johnson is an instructor for the UCLA Extension Writer's Program. The first book in her HowToDoItFrugally Series of books, The Frugal Book Promoter, won USA Book News'Best Professional Book Award and Book Publicists of Southern California's Irwin Award. The second, The Frugal Editor, was just released and includes many editing tips on dialogue, the use of quotation marks and more. Learn more at www.howtodoitfrugally.com. I love to draw. LOVE it! It’s therapeutic for me. There's a box full of paintings, sketches, doodles, and pastel drawings sitting in my cedar chest to prove it. And that’s where they’ll stay. In my cedar chest. You will never see my art in a picture book or on the cover of a children’s magazine. Why? Because it’s obvious that I’m NOT a professional illustrator! I’m self-taught and not good enough for today’s publishing standards. I’ve had no formal training and would never send pages of my artwork along with my manuscript submissions. That doesn’t bother me at all. Want to know how to make an editor REALLY MAD? Ignore their Illustrator guidelines that say, “Send brochures, resumes, samples, tearsheets, promo sheet, or slides.” That means they are speaking to professional illustrators. If you are not a professional and you send your art anyway, it’s no different than completely disregarding the writer’s guidelines. You’re basically telling the publisher they don’t know what they’re talking about. That can be the kiss of death for your manuscript. I can’t tell you how many times I’ve received manuscripts for critique with artwork included. Rarely were the authors or their illustrator friends or relatives true professionals. Eraser marks. Whiteout. Crayon shavings. Smudges. Disproportionate, stiff characters. No movement. No life. Not professional. Sort of like MY drawings! If you are not a professional illustrator but insist that your art is good enough, here’s a suggestion---ask a professional illustrator at a writers conference to give you an honest evaluation. Don’t forget to look at all the portfolios on the table. How do your illustrations stack up? Be honest. Personally, I don't need to do this with my artwork because I'd embarrass myself. I KNOW my stuff isn't up to speed! Here’s another suggestion. Compare your illustrations with at least 25 children’s books. How does your art compare? Again, be brutally honest. Unless you are a true professional your art will probably fall short. In my humble opinion, 99% of the time your publisher knows just the artist to make your book come alive! 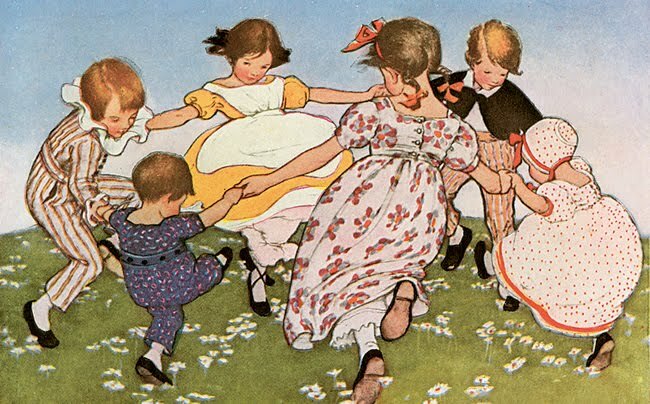 When it comes to picture books, illustrations make half the book. So, if your best friend, Aunt Beatrice, your child (whose heart WILL be broken), or your spouse want to illustrate your book, please just say "No," but say it gently. Tell them it's nothing personal. It's just the way it is in publishing, and YOU as the writer need to follow the guidelines. When I'm needing an idea for another magazine story or a book, there's one resource I go to immediately because it never fails me. It's the book of Proverbs---the book of wisdom in the Bible. Just ONE proverb can be a theme with a story waiting to happen! My fiction stories are not overtly religious and don't need to be. The book of Proverbs is filled with jewels of wisdom for wise living and themes that apply to children as well as adults. Here are just a few of the Proverbs that have triggered a book or story or two, or three, or---well you get the idea. Need some inspiration and a heart filled with joy at the same time? I've heard that a first grade teacher collected well known proverbs. She gave each child in her class the first half of a proverb and asked them to come up with the remainder of the proverb. You can lead a horse to water but................how? A miss is as good as a.....................................Mr. The combination of magnificent, richly colored illustrations by Layne Johnson, and Catherine's amazing facts, will hold the attention of an entire class or assembly! Q: Catherine, what prompted you to write about this particular subject? A: I originally wrote this as a holiday alphabet book about the 4th of July. The publisher, Pelican Publishing Company, preferred a story about the Declaration of Independence, so I rewrote my manuscript to tell the history of this famous document. Q: Kids can sometimes think of history as booooring. I know I did. Sigh. 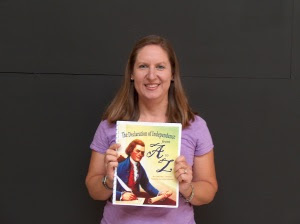 What is it about YOUR book that makes the topic of the Declaration of Independence EXCITING for children? A: I tried really hard to make the text informative as well as interesting. The illustrations, painted by Layne Johnson, created a beautiful backdrop that made my words come alive. I think this blend of words and pictures will draw reluctant history readers in, allowing them to learn and to be entertained at the same time. Q: What was the most difficult part of writing this book? A: I took three months to research all I could about the period of time in America and about the Declaration itself. The hardest part was trying to compact all that information into 26 letters, while also writing it in chronological order so that it made sense. Q: Catherine, have you always wanted to be a writer? A: No. I grew up wanting to be a scientist, and ended up going to school to learn about film making. I didn't become a writer until about eight years ago when a friend asked for help developing her writing skills. As I taught her about creating stories, I realized that I enjoyed the writing process, and I haven't stopped since. Q: What advice would you give to students or adults who want to be writers? A: Read, read, and read some more so you can understand what makes a good story. Learn the rules of grammar, then keep writing and revising, until you can write a story well, with a beginning, a middle, and an end. A: I write articles and short stories for magazines, newsletters, and for an early reader program, but I really want to write middle grade novels. I'm working on a mystery series that I hope will be published some day. THANK YOU, Catherine! I hope your success story has inspired other writers to press on! Write for the Educational Market with Evelyn's Help! Well, Evelyn Christensen has done it again! She's gets another A+ on her market research. Ev graciously shares her discoveries for publication possibilities--- just because she's NICE. According to Ev, her market list has "a few new tidbits." She is quick to point out and thank Susan Ludwig, a freelance children's writer, for assisting with updating the market list. If you haven't considered writing for the educational market, you might want to think again. 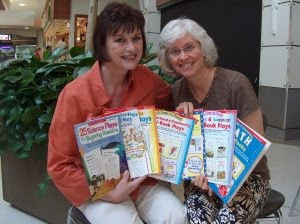 Nancy I. Sanders and I (photo)have co-authored seven educational books together for Scholastic Professional Books! My latest book was released November 1, 2009, Easy-To-Read Science Plays: The Human Body. Check out Evelyn's site. She's got a looooong list of publishers who have some definite needs and guidelines. Who knows---YOU could be just the writer they're looking for! Oh, and one more thing---THANK YOU, EVELYN and SUSAN! I'm posting this again in case you missed this INCREDIBLE piece by author Marilyn Cram Donahue. I hope when you've finished reading this post, you'll try the "I Am From..." poetic form. It will certainly get those creative thoughts flowing. I am privileged and blessed to be Marilyn's friend. We are members of the critique group I so often speak of---Wordsmiths. 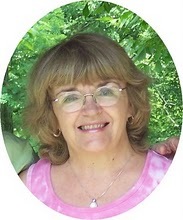 Marilyn writes books, stories and articles for middle grade, YA, and adult. She claims to never go anywhere without a notebook tucked away and one of those automatic pencils that never gets dull and always has an eraser. I absolutely believe her. on the "I Am From..." poetic form. The “I Am From . . .” poetic form was developed by George Ella Lyon. It has been successfully used in schools across the country. Some of the results are wonderful, with students reaching into their everyday lives and ethnic backgrounds and coming up with single images that are worth a thousand words. It occurred to me that this would be a good exercise in the class I teach on Writing Your Memoirs. This week we looked back to our early school years and concentrated on remembering one incident that might bring to mind many images. Then we wrote “I Am From . . .” poems with those memories as starting points. to float on the cool night air. and whipped cream and a cherry on top.
. . . or so he said. Can you imagine a character in one of your books writing an “I Am From . . .” poem? What would you learn by letting this person tell you how he or she feels? By standing to one side and listening while your character digs deep and comes up with what might be surprising information? Thank you, Marilyn! Let's hear from some of my blog friends. I'd like to know if your characters revealed some surprises. Beginning Writer? Growing Writer? Go to the Children's Book Insider! * Can I really make it as a children's writer? * Is it difficult to get started? * Do I have to spend a ton of money on classes and books? You can even watch short, instructional videos online. 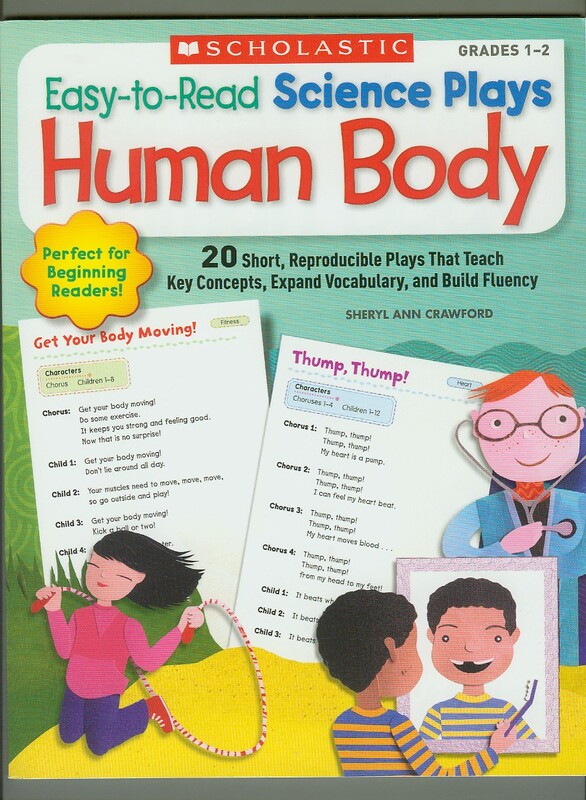 You’ll find step-by-step instruction on their website and in the CBI Newsletter that will help you enter this fascinating field of writing for kids. I just finished reading the January 2010 issue of the Children's Book Insider. Jon Bard challenges writers in his piece, From the Editor, to enter the 21st century by doing things like blogging, building a Facebook Fan page, and Twittering. Jon wrote, "Don't be BORING." Now that's how to lose your followers for sure! He's reminding writers that merely blogging about daily activities on our blogs "won't cut it." He's right. Jon encourages writers to offer "fresh perspectives", and to direct our readers to great links. That's precisely what I'm doing right now! Please visit www.CBIClubhouse.com and get excited about the possibilities! You never know where a contest story will take you. You don't actually have to win first, second, or even third place, to "win" in a different way. Years ago I entered a Highlights 500-word beginning reader fiction contest. Kitten's Climb didn't win, but an editor thought it was delightful, and choose to publish it. Several years later I was surprised to receive a letter and another check from Highlights. They paid me again for the story when Harcourt Trophies purchased it for a reading comprehension booklet to be used in elementary schools across the country. Today Kitten's Climb is accessible online. Click the link at the end of this post. I LOVE the mother Robin's attitude, and Kitten's final assessment of the whole ordeal. Here's another plus---the reading assessment booklet is listed on my publishing bio along with the link so editors can read a sample of my work for this particular age group. Cool. * Theme - fiction based on a true story from your family. * You must be at least 16 years old. * They do not want to see violence, crime, or derogatory humor. * Put the word count at in the upper right-hand corner of the first page. * Entries must be postmarked between January 1, 2010 and January 31, 2010. Church Street, Honesdale, PA 18431. Three winners will be chosen, published in Highlights, and given their choice of a $1,000 cash prize, or tuition to the Highlights Chautauqua writing workshop! Winners will be announced on their website in June 2010. So, what are you waiting for? You never know where a magazine story will take you. One of my stories from Clubhouse Jr. Magazine became a picture book! Kitten's Climb became a winning story in more ways than one.